2. In which of the following, both pairs have correct combination? 8. Which one of the following is not used for ex situ plant conservation? 9. 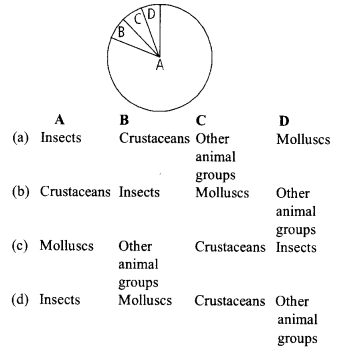 Which of the following represent maximum number of species among global biodiversity? 11. Which of the following has maximum genetic diversity in India? 12. Which organization publishes the ‘Red Data Book’? 13. Which one of the following areas in India, is a hotspot of biodiversity? 14. Select the correct statement about biodiversity. (a) The desert areas of Rajasthan and Gujarat have a very high level of desert animal species as well as numerous rare animals. (b) Large scale planting of Bt cotton has no adverse effect on biodiversity. (c) Western ghats have a very high degree of species richness and endemism. 16. Which one of the following have the highest number of species in nature? 17. Consider the following statements (A – D) each with one or two blanks. (A) Bears go into (11)during winter to (21) cold weather. (B) A conical age pyramid with a broad base represents (31) human population. (D) An area with high levels of species richness is known as (51) . Which one of the following options, gives the correct fill ups for the respective blank numbers from (1) to(5) in the statements ? 19. Study the four statements (i-iv) given below and select the two correct ones out of them. (iv) Production of chemicals such as nicotine, strychnine by the plants are metabolic disorders. 20. Which one of the following is an example of ex-situ conservation? 21. The Indian rhinoceros is a natural inhabitant of which one of the Indian states? 22. Which one of the following has maximum genetic diversity in India? 23. Tiger is not a resident in which one of the following national park? Which area out of p – s shows maximum species diversity? 25. Which one of the following is not observed in biodiversity hotspots? 27. Which one of the following pairs of organisms are exotic species introduced in India? 28. Identify the odd combination of the habitat and the particular animal concerned. (d) Dachigam – Snow Leopard. 30. Which of the following is considered a hot-spot of biodiversity in India? 31. Which of the following pairs of an animal and a plant represents endangered organisms in India? 32. Which one of the following is not included under in- situ conservation? 33. Which one of the following is the correctly matched pair of an endangered animal and a national park? 34. Biodiversity Act of India was passed by the Parliament in the year. 35. According to IUCN Red List, what is the status of Red Panda (Ailurus fulgens)? 36. In your opinion, which is the most effective way to conserve the plant diversity of an area? 37. Which group of vertebrates comprises the highest number of endangered species ? 38. Which endangered animal is the source of the world’s finest, lightest, warmest and most expensive wool – the shahtoosh ? 39. Wild life is continuously decreasing. What is the main reason of this? 42. Which of the following is mainly responsible for the extinction of wild life? 43. What is the major cause of diminishing wildlife number? 48. Which of the following is the matching pair of a sanctuary and its main protected wild animal? In situ (on site) conservation is conservation and protection of the whole ecosystem and its biodiversity at all levels, in order to protect the threatened species. Two in situ methods are being used to save biodiversity viz., hot spots and protected areas. Protected areas include national parks, sanctuaries, biosphere reserves and sacred groves. Ex situ (off site) conservation is conservation of selected rare plants/animals in places outside their natural homes. Ex situ conservation includes offsite collections, seed banks, gene banks, in vitro fertilization, cryopreservation techniques and tissue culture. Cryopreservation is an advanced method of ex situ conservation. It involves preservation at -196°C in liquid nitrogen. It can maintain tissue culture, embryos, animal cells/tissues, spermatozoa indefinitely. The cryopreserved material is revived through special technique, when required. In situ conservation implies conserving wildlife in their natural habitat e.g., National parks, Biosphere Reserves and sanctuaries. Ex situ conservation includes protecting wildlife, their propagules and germplasm outside their habitat e.g. cryobanks, seed banks, herbaria, etc. The taxon under critically endangered category are facing very high risk of extinction in the wild and can become extinct at any moment in the immediate future. IUCN is International Union of Conservation of Nature and Natural Resources which is now called World Conservation Union (WCU). It has its headquarters at Morges, Switzerland. It maintains a red data book or red list which is a catalogue of taxa facing risk of extinction. Ex situ conservation is conservation of selected rare plants/animals in places outside their natural homes. It includes botanical gardens or zoological parts, seed banks, cryopreservation, field gene banks and sacred plants. Many wild and domesticated species are well managed and collected in botanical gardens, zoological parks, wild life safari parks, arboreta etc. Most of these have capture breeding programmes to restore the decreasing number of animals and helping the survival of existing individuals of the species. Gene banks are institutes that maintain stocks of viable seeds (seed banks), live plants (orchards), tissue culture and frozen germplasm with the whole range of genetic viability. Fungi is a large kingdom of over 72,000 species. They are achlorophyllous, heterotrophic, spore forming, non-vascular, eukaryotic organisms which contain chitin or fungal cellulose in their walls and possess glycogen as food reserve. They are major decomposers of many ecosystems and are associate of many organisms. Nagaijunasagar – Srisailam Tiger Reserve is the largest tiger reserve in India. It is present in Andhra Pradesh with a total area of 3568 km2. The core area of this reserve is 1200 km2. Genetic diversity is the diversity in the numbers and types of genes as well as chromosomes present in different species and the variations in the genes and their alleles in the same species. Oryza sativa (rice) has 32,000-50,000 genes. IUCN is International Union of Conservation of Nature and Natural Resources which is now called World Conservation Union (WCU). It maintains a red data book or red list which is a catalogue of taxa facing risk of extinction. Red data book or red list was initiated in 1963. The Red list of year 2000 has made assessment of 18,000 species. Hot spots are areas with high density of biodiversity or megadiversity which are also the most threatened ones. Ecologically hot spots are determined by four factors – number of species/species diversity, degree of endemism, degree of threat to habitat due to its degradation and fragmentation, and degree of exploitation. India has three hot spots : Indo-Burma, Himalayas and Western Ghats – Sri Lanka. India is even otherwise a country of megadiversity with 2.4% of land area and having 8.1% of global diversity. Major centres of biodiversity are Agasthyamalai hills, Silent valley and Amambalam reserve. There is high degree of endemism as well as richness of species of flowering plants, amphibians, reptiles, some mammals and butterflies. Sacred grove is an example of in situ conservation of forests and wildlife especially rare and threatened species. These forest patches are found around places of worship which are held in high esteem by tribal communities. They are the most undisturbed forest patches which are often surrounded by highly degraded landscapes. Not a single branch is allowed to be cut from these forests. As a result many endemic species which are rare or have become extinct elsewhere can be seen to flourish here. Such sacred groves are found in Khasi and Jaintia hills of Meghalaya, Aravalli hills of Rajasthan, Western ghat regions of Karnataka, Maharashtra, Sarguja, Chanda and Bastar areas of Madhya Pradesh. Insects have highest number of species found in nature. The insecta is the largest class of animals. It has over 7,00,000 species. The insects are the most successful land invertebrates and the only major competitors with humans for dominance in the world. Biodiversity (biological diversity) is the existence of a wide variety of species (species diversity) or other taxa of plants, animals and microorganisms in a natural community or habitat, or of communities within a particular environment (ecological diversity), or of genetic variation within a species (genetic diversity). The maintenance of a high level of biodiversity is important for the stability of ecosystems. Predator any prey evolve together. The prey is part of the predator’s environment, and the predator dies if it does to get food, so it evolves whatever is necessary in order to eat the prey. Likewise, the predator is part of the prey’s environment, and the prey dies if it is eaten by the predator, so it evolves whatever is necessary to avoid being eaten. So, predators cannot lead to the extinction of prey species. Nicotine is an alkaloid found in the night shade family of plants (solanaceae) that constitutes approximately 0.6- I 3.0% of dry weight of tobacco, with biosynthesis taking place in the roots and accumulation occurring in the leaves. Strychnine is an alkaloid plant toxin extracted chiefly from Nux vomica; formerly used as a stimulant. These are not metabolic disorder products but are metabolic wastes. The Indian rhinoceros is a endemic of north¬east region of India. Kaziranga national park (Assam) is famous for rhinoceros. Genetic diversity is the diversity in the number and types of genes as well as chromosomes present in different species and the variation in the genes and their alleles in the same species. India has more than 50,000 genetically diverse varieties of rice and 1000 varieties of mango. Gir national park is situated in district Junagarh of Gujarat. This national park is famous for Asiatic lion. Beside lion, panther, striped hyaena, sambhar, nilgai, chital are also conserved. Species diversity is related to the variety in the number and richness of the species within a region and is measured at the level of‘species’. Thus, it is the product of species richness and species evenness. Species richness refers to the number of species per unit area. As the area of the site increases, the number of species also increases due to more availability of natural resources. Species evenness is the relative abundance with which each species is represented in an area. Thus, variation in the number of species, kinds of species as well as the number of individuals per species lead to greater diversity. In the given table, the area which shows maximum species diversity is ‘s’. Conservation of biodiversity is a collective responsibility of all nations. The historic Convention on Biological Diversity (‘The Earth Summit’) held in Rio de Janeiro in 1992, called upon all nations to take appropriate measures for conservation of biodiversity and sustainable utilisation of its benefits. In a follow-up, the World Summit on Sustainable Development held in 2002 in Johannesburg, South Africa, 190 countries pledged their commitment to achieve by 2010, a significant reduction in the current rate of biodiversity loss at global, regional and local levels. As opposed to native species, which are indigenous and found naturally in an environment, animals and plant species introduced from other countries and which are not otherwise found local are termed exotic. These introduced or exotic species can adversely affect the ecosystem. In India, large variety of exotic animal and plant species have been introduced from other parts of the world through the ages. Some exotic plants have turned into weeds, multiplying fast and causing harm to the ecosystem, e.g. water hyacinth and Lantana camara. Water hyacinth was introduced in Indian waters to reduce pollution. It has clogged water bodies including wetlands at many places resulting in death of aquatic orgnisms. Dachigam National Park is located only 22 kilometers from Srinagar, the capital city of the northern state of Jammu and Kashmir. It covers an area of 141 square kilometers consisting of some of the most scenic natural beauty present on Earth. The variation in altitude is vast, ranging from 5500 ft to 14000 ft above mean sea level. Due to this vast variation, the park is very clearly demarcated into an upper and lower region. Dachigam is considered home to some of the unique Himalayan range of flora and fauna. Primary amongst them is the hangul or Kashmiri stag, the most endangered species of red deer in the world. It was finally upgraded and declared a National Park in the year 1981. An endangered species is a population of an organism which are at risk ofbecoming extinct because it is either a few in number or threatened by changing environmental or predation parameters. Podophyllum is such an endangered species of Indian medicinal plants. They contain, podophyllotoxin and podophyllin that is used as a purgative and as a cytostatic. They are also grown as ornamental plants for their attractive foliage and flowers. Extracts of plants are used for genital warts and some skin cancers. An endangered species is a living organism in danger of disappearing from the face of the earth if it is not protected and its situation is not improved. Red panda (Ailurus fulgens) and Bentinckia nicobarica are endangered organisms of India. The red panda (Ailurus fulgens) faces problems with human encroachment into its habitat. Bentinckia nicobarica is a fast-growing, slender and elegant, pinnate palm from the Nicobar Islands in the Andaman Sea north of Sumatra. In-situ conservation means “on-site conservation”. In situ conservation is the protection and management of important components of biological diversity through a network of protected areas. Botanical gardens come under Ex situ conservation which is a conservation outside the natural habitats of plants by perpetuating sample populations. Kaziranga national park of Assam is selected for the conservation of Rhinoceros. The biological Act provides for conservation of biological diversity, substainable use of its components and fair and equitable sharing of the benefits arising out of the use of biological resources, knowledge and for matters connected there with or incidental there to. The biological act of India was passed in 2002. This act of parliament received the assent of President of India on the 5th February 2003. According to IUCN Red list, the status of Red panda (Ailurus fulgens) is endangered species. Endangered species are those species that are facing a very high risk of extinction in the wild in the near future. This category is used when the species suffered a population reduction of 80% or more. Vulnerable species have sufficient population at present but are depleting fast, e.g., Golder langur, leopard cat. Extinct species no longer exist e.g., Dodo. Critically endangered species are threatened to a greater extent. Biosphere reserves are multipurpose protected areas of different representative ecosystems which are meant for conservation of biodiversity or wild-life, traditional life tyle of tribals and their domesticated animals and also plant resources. Each biosphere reserve has a core zone (where no human activity is allowed), a buffer zone (with limited human activity) and manipulation zone (where human activity is allowed without degradation of ecology. Thus the biosphere reserves protect not just wild varieties ies but also domesticated varieties of plants of an area. A taxon is endangered when its populations have decreased or habitats have been reduced to the levels that pose immediate danger of extinction. They are not likely to survive if the factors threatening their extinction continue. IUCN Red List'(2004) documents the extinction of 784 species (including 338 vertebrate species, 359 invertebrate species and 87 plant species) in the last 500 years. On worldwide basis, more than 15,500 species ae facing the threat of extinction. At present, 12% of the bird species, 23% of mammal species, 23% ofmammal species, 32% of amphibian species and 31% of gymnosperm species are facing the threat of extinction in the world.Several endangered mammalian species are Panthera pandus (Leopard), Panthera leo persica (Lion), Presbytis pilaetus (capped langur) etc. Chiru or the Tibetan antelope (Pantholops hodgsoni) is medium-sized bovid which is about 1.2 m in height. Its coat is grey to reddish brown, with a white underside. The Chiru’s wool, known as shahtoosh, is worm, soft and fine. The wool can only be obtained by killing the animal. It is listed as endangered by the world conservation union and the United States Fish and Wildlife Service due to commercial poaching for its wool. Wild life refers to all living organisms (terrestrial, aquatic and aerial) living in all possible natural habitats of their own, other than the cultivated plants and domesticated animals. Thus “wild life” does not exist only in jungles and are hunted down but wild life includes even the migrating birds, turtles, coral reefs, microorganisms, insects, fishes, etc. Several hundred organisms are endangered or on the verge of extinction. The reasons are deforestation, pollution, killing, over exploitation etc. The most important among them is deforestation or destruction of their natural habitat because it will affect the species (flora and fauna) of complete area and not only the few organisms. The natural habitat may be destroyed by man for his settlements, grazing grounds, agriculture, mining, industries, dam building etc. As a consequence of this, the species must adapt to the changes, move elsewhere or may succumb to predation, starvation or disease, and eventually dies. Indri-indri lemur is found in Madagascar. It is the largest of all surviving lemurs and is best known for its beautiful song which can carry for more than 2 km. It is active during the day, feeding on canopy fruit and leaves. Today, the Indri’s number is small and dwindling due to habitat loss. Viable material of endangered species can be preserved by gene bank. Gene bank is an institute that maintains stocks of viable seeds (seed banks), live growing plants (orchards), tissue culture and frozen germplasm with the whole range of genetic variability. or domesticated nor tamed. Deforestation or destruction of their natural habitat will affect the species (flora and fauna) of complete area and not only the few organisms. The natural habitat may be destroyed by man for his settlements, grazing grounds, agriculture, mining, industries, dam building etc. As a consequence of this, the species must adapt to the changes, move elsewhere or may succumb to predation, starvation or disease, and eventually dies. Kaziranga national park is famous for one- homed rhinoceros of India. Other animals found are elephant, wild buffalo, bison, tiger, leopard, sloth bear etc. Corbett national park is famous for tigers. Gir national park is famous for the asiatic lions. Runn of Kutch is famous for chinkara. Flamingoes are protected in Chilka lake, Orissa. Other important birds protected are water fowls, ducks, cranes, golden plovers, sandpipers etc. Manas biosphere reserve is located in Assam. To save tiger from extinction, ‘Project Tiger’ was launched in our country in 1972. Since, then the tiger population is slowly increasing. In Manas, the tiger population was 31 in 1972 and 41 in 1973. Corbett National Park is located in district Nainital of Uttaranchal. BandipurNational Park is located in district Mysore of Karnataka. Palamu is located in Chhotanagpur, Jharkhand. Gir sanctuary is a dense forest of 70 km length and 45 km width, situated in Gujarat. This forest is divided into 9 sub-divisions namely-Hiran, Shingavado, Shingavadi, Raval, Dhatervadi, Malan, Machhundari, Papatidi and Shattunji. The climate is hot and humid. The lions are the main attraction of the forest. The Gujarat Government is very keen for the protection of lion. Thus, the Gir sanctuary was extended over both vegetational zones and open area of about 140 square km in 1973 which was upgraded into a National park in 1975. A long live hedge wall of 468 km has been maintained to protect the living area of lions in this forest. Kaziranga national park is famous for one-horned rhinoceros and Sunderbans is a tiger reserve.